NOTE: This page was largely created in 2012 and is preserved here for archival and reference purposes. Some editing of content has taken place since, while some images were added. For further updates, check more recent posts discussing the respective topics. The word albedo is derived from the Latin word "albus" (white). The range of possible values of albedo (whiteness) goes from 0 (darkest) to 1 (brightest). Albedo change occurs when a surface changes in color, e.g. if a snow-covered area warms and the snow melts, the albedo decreases. The average overall albedo of Earth is 30 to 35%. There are two areas where albedo changes are felt most in the Arctic, i.e. decline of the sea ice and decline of the snow and ice cover over Greenland, North America and Eurasia. 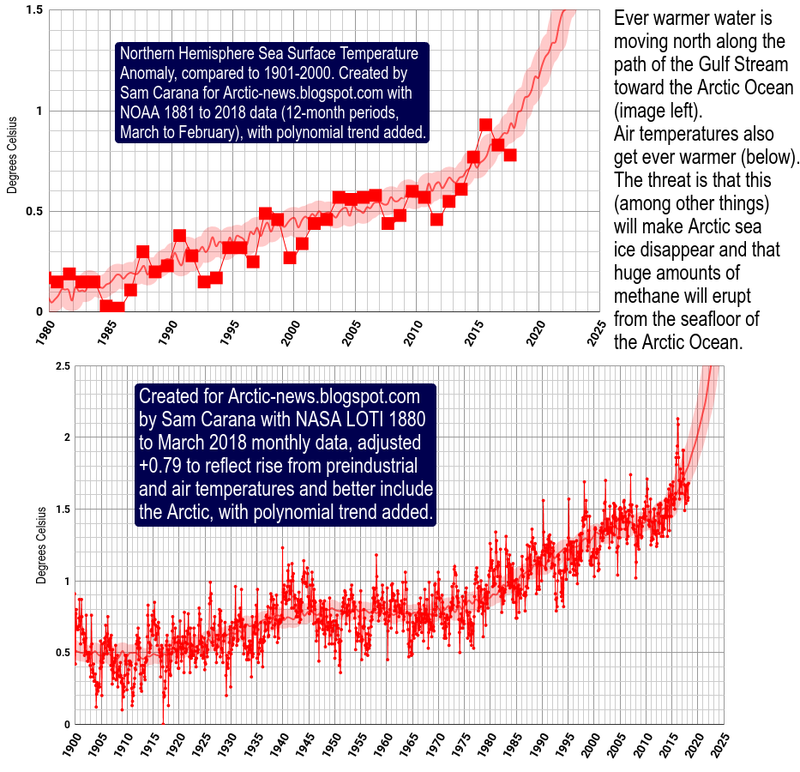 Decline of the Arctic sea ice is accelerating, due to numerous feedbacks. As the Arctic atmosphere warms up, any snow cover on top of the ice will melt away ever more quickly, decreasing the surface albedo and thus reinforcing the warm-up. As melt ponds appear on top of the ice, the albedo will drop even further. Sea ice reflects 50% to 70% of the incoming energy, while thick sea ice covered with snow reflects as much as 90% of the incoming solar radiation. 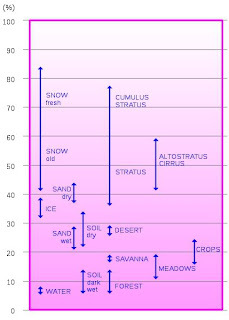 After the snow begins to melt, and because shallow melt ponds have an albedo of approximately 0.2 to 0.4, the surface albedo drops to about 0.75. As melt ponds grow and deepen, the surface albedo can drop to 0.15. 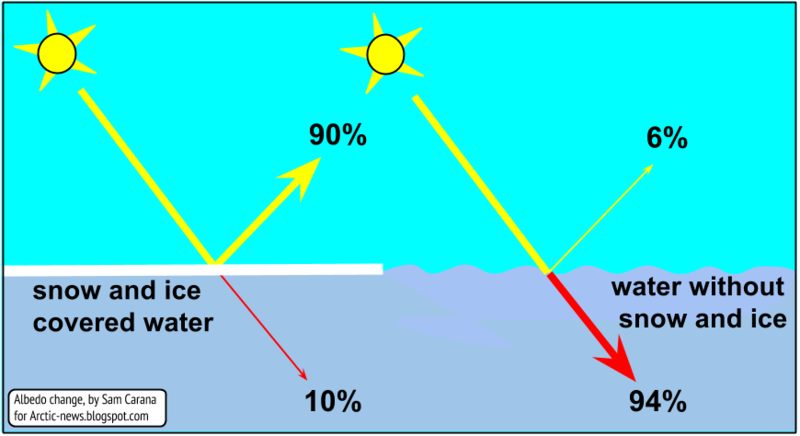 The ocean reflects only 6% of the incoming solar radiation and absorbs the rest. Latent heat is energy associated with a phase change, such as the energy absorbed by solid ice when it changes into water (melting). During a phase change, the temperature remains constant. Sea ice acts as a buffer that absorbs heat, while keeping the temperature at zero degrees Celsius. As long as there is sea ice in the water, this sea ice will keep absorbing heat, so the temperature doesn't rise at the sea surface. The amount of energy absorbed by melting ice is as much as it takes to heat an equivalent mass of water from zero to 80°C. The energy required to melt a volume of ice can raise the temperature of the same volume of rock by as much as 150ºC. Once the sea ice is gone, further heat must go elsewhere, i.e. it will typically raise the temperature of the water. The atmosphere will also warm up faster. More evaporation will also occur once the sea ice is gone, further warming up the atmosphere (technically know as latent heat of vaporization). As temperatures in the Arctic are rising faster than at the Equator, the Jet Stream will change, making it easier for warm air to enter the Arctic. More clouds will form over the Arctic, which will reflect more sunlight into space, but which will also make that less outward IR radiation can escape into space over the Arctic, with a net warming effect. 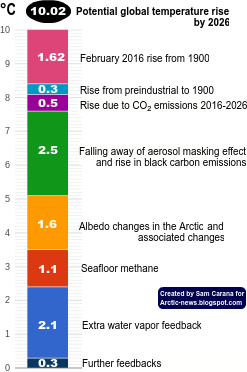 One huge danger is that, as the buffer disappears that until now has consumed huge amounts of ocean heat, further heat will reach methane hydrates at the seafloor of the Arctic Ocean, causing them to get destabilized and release methane. The size of the June snow and ice cover is vitally important, as insolation in the Arctic is at its highest at the June Solstice. During the months June and July, insolation in the Arctic is higher than anywhere else on Earth, as shown on the image below, by Pidwirny (2006). While Greenland remains extensively covered with snow and ice, the reflectivity of its cover can decline rapidly, as illustrated by an earlier post from the meltfactor blog. 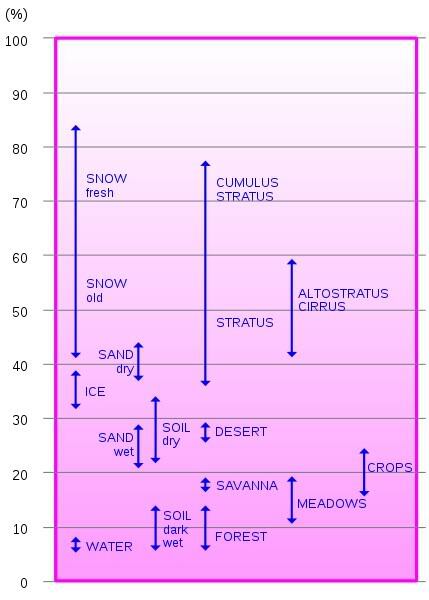 This rapid decline occurs not only due to exposure of darker soil, but also due to formation of melt ponds and because melting snow reflects less light. Furthermore, huge amounts of dust, soot and organic compounds originating from human activities get deposited on Greenland, reducing its reflectivity. Organic compounds in meltwater pools can furthermore lead to rapid growth of algae at times of high insolation. Finally, calving of the ice can take place where warmer water can reach it, and such calving can strengthen due to strong winds and waves. The Arctic Ocean covers 2.8% of Earth's surface. 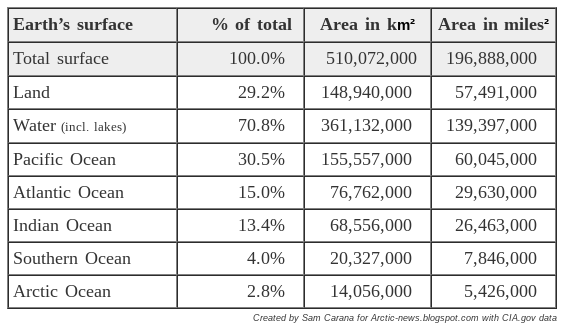 Earth has a total surface area of 510,072,000 km² (196,888,000 miles²), as the table below shows. Sea ice extent was well under 4 million km² throughout September 2012, as compared to under 8 million square km in 1980, a difference of about 4 million km². The albedo change associated with this difference will be even more dramatic, given the (slushy and this lower albedo) state of the ice in 2012. How much radiative forcing would this represent, i.e. a retreat from an extent of 8 million square km to 4 million square km, and than another such change, i.e. a collapse from 4 million km² to zero? Professor Peter Wadhams, University of Cambridge, once calculated that if a sea ice area of 4 million square km, with a summer albedo of about 0.60 (surface covered with melt pools) collapses and disappears altogether, the entire area is replaced by open water which has an albedo of about 0.10. This will thus reduce the albedo of a fraction 4/510 of the earth's surface by an amount 0.50. The average albedo of Earth at present is about 0.29. So, the disappearance of summer ice will reduce the global average albedo by 0.0039, which is about 1.35% relative to its present value. A drop of as little as 1% in Earth’s albedo corresponds with a warming roughly equal to the effect of doubling the amount of carbon dioxide in the atmosphere, which would cause Earth to retain an additional 3.4 watts of energy for every square meter of surface area (NASA, 2005; Flanner et al., 2011). Based on those figures, a global drop in albedo of 0.0039 is equivalent to a 1.3 W/m² increase in radiative forcing globally. A collapse of the sea ice would go hand on hand with dramatic loss of snow and ice cover on land in the Arctic. The albedo change resulting from the snowline retreat on land is similarly large as the retreat of sea ice, so the combined impact could be well over 2 W/m². To put this in context, albedo changes in the Arctic alone could more than double the net radiative forcing resulting from the emissions caused by all people of the world, estimated by the IPCC to be 1.6 W/m² in 2007 and 2.29 W/m² in 2013.